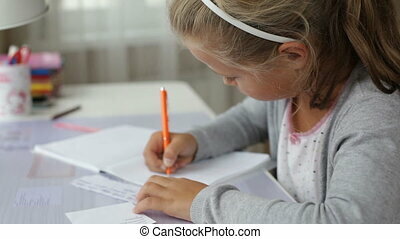 Cute girl sitting at table at home doing her homework for school as she writes notes to workbook. 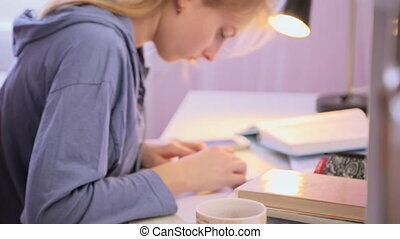 Thoughtful teenage girl doing her homework with blurry mother cooking in the kitchen on background. 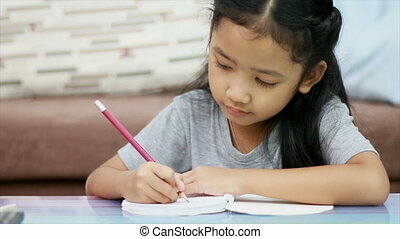 Clever diverse cute girls doing homework for elementary school while sitting at desk over domestic interior background. 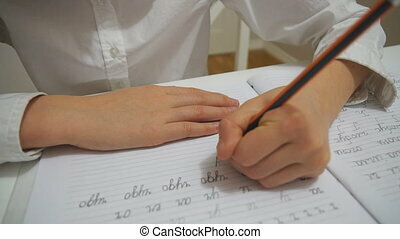 Smart school girls learning together at home and writing tasks in textbooks. 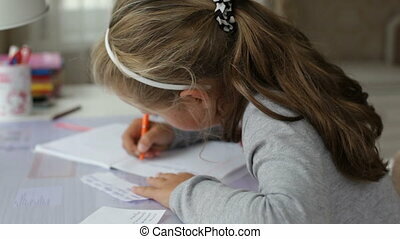 Little girl is doing homework at home. Bored school girl in eyeglasses unwilling to do her homework while studying together with her mother at home. Lazy teenage girl and her frustrated mom doing homework for middle school indoors. 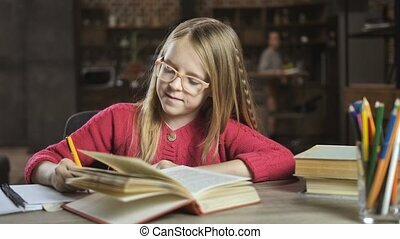 Cheerful school girl in eyeglasses doing homework online with laptop at home. 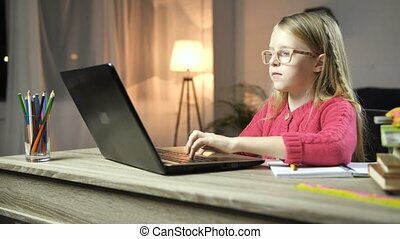 Positive teenage girl learning with laptop computer and internet as she sits at table in domestic room. Slo mo. Dolly. 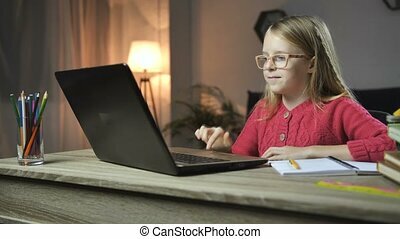 Adorable school girl in eyeglasses typing on laptop computer in domestic room in the evening. Concentrated child sitting at the table and working on her homework with laptop at home. Slo mo. Dolly. 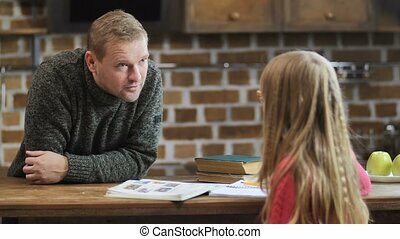 Positive teenage girl studying with textbooks at home and talking to mother. 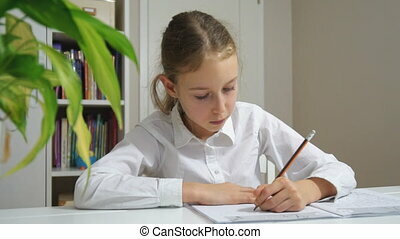 Cheerful cute girl doing homework for middle school indoors with mother preparing food in the kitchen on background. Caring stay-at-home dad scolding his lazy daughter for bad grades in the kitchen. 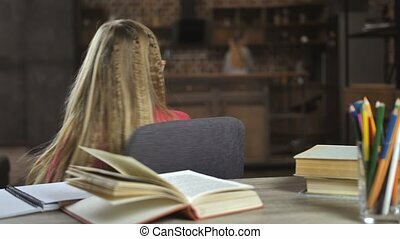 Bored blond hair teenage girl is unwilling to do her homework and study for exams at junior high school. Top view of cute girl lying on the carpet on the floor and doing her homework using laptop computer. 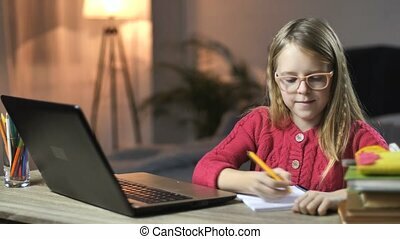 Schoolgirl studying at home on computer and taking notes in notebook. 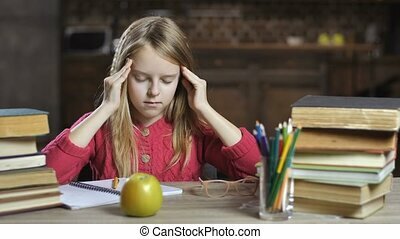 Sad teen girl sitting at the desk, trying to study and do her homework while her parents are having a disagreement on the background. Lovely upset girl listening to her mom and dad fighting. Dolly. Worried attractive young mother scolding her pouting daughter who is unwilling to do homework in domestic room. Bored lazy teenage girl studying her lessons looking unhappy at home. Cute school girl in eyeglasses studying online on laptop, writing information down to notebook at home. Concentrated teenage girl with laptop computer e-learning indoors. Tired girl sleeping at the desk at home. 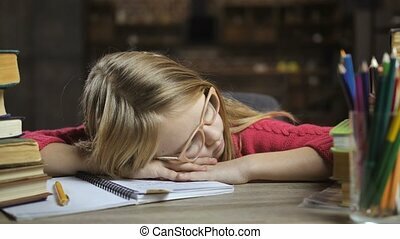 Teenage girl was studying hard at home for her exams and fell asleep at the table, surrounded by stack of books. Exhausted junior high student. Dolly shot. Blond hair girl got angry because she doesn't want to study. 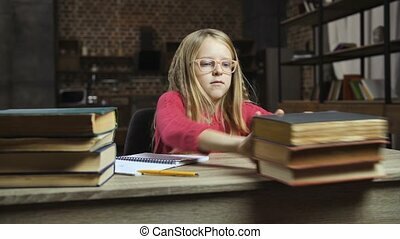 Fed up teen in eyeglasses throws books out of the desk and sits with her head propped up in hands, unwilling to do her homework.